Various scholars, acclaimed artists and filmmakers from across the country will present at this conference. SAN JOSE, Calif.- The Persian Studies Program at San Jose State, with support from the Roshan Cultural Heritage Institute and the College of Humanities and the Arts, will hold the first-ever “Cultures of the Iranian Diaspora” conference on Friday, April 11, and Saturday, April 12, at SJSU. This conference brings together visual artists, writers, filmmakers and cultural activists who have been making art and representing the experiences, perspectives and sentiments of a diverse community of Iranians in the United Since over the past three decades. Panels and discussions will convene in the Dr. Martin Luther King Jr. Library, rooms 225/229 and 255 , on Friday morning. Registration for the conference for both days including lunch is $60 for the general public and $50 for students. Advanced registration is required. Various scholars, acclaimed artists and filmmakers from across the country will present at this conference while representing institutions including the University of Southern California, Boston University, California College of Arts, UCLA, California Institute of Integral Studies and UC Irvine. Participants will provide a multi-dimensional exploration of how art has helped shape a conversation about Iran, migration to the West and the unique culture of Iranian Americans and the Iranian diaspora. 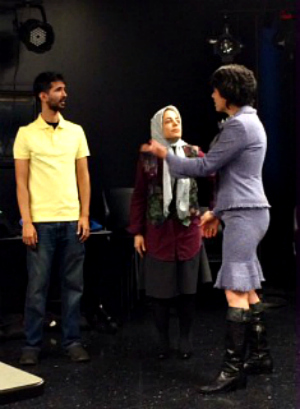 The play “Inja o Oonja: Stories from Iranian American Life,” featuring Kyle Swany, Mehrzad Karimabadi and Sara Mashayekh, will premiere at the “Cultures of the Iranian Diaspora” conference (photo courtesy of Persis Karim). The conference also features a play titled, “Inja o Oonja—Here and There: Stories from Iranian American Life,” adapted by SJSU Theater Arts Professor Dr. Matthew Spangler from three short stories by Iranian American writers on Friday, April 11, at 7 p.m. at the Le Petit Trianon Theatre (72 N. Fifth St., San Jose). To conclude the conference events, a film-screening and discussion of two films by SJSU Professor Babak Sarrafan (Radio, Television, Film and Theater) and San Jose native Mo Gorjestani will be held on Saturday, April 12, in the Student Union Ballroom at 7 p.m. Both of these evening events are free and open to the public. SJSU’s Persian Studies Program was established in March 2011 with funding from a grant from PARSA Community Foundation and received a generous three-year grant from the Roshan Cultural Heritage Institute to continue the work of educating the SJSU community about the rich culture, history and heritage of the Persianate world, including the Iranian diaspora. 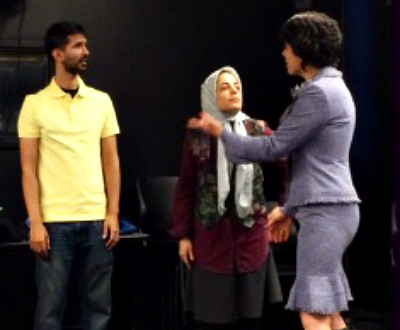 Since 2011, Persian Studies at SJSU has offered courses in beginning Persian through the World Languages department and has hosted numerous lectures with scholars, film-screenings, musical events and book readings. This year’s events commenced with lectures “Jews of Iran” featuring Dr. Jaleh Pirnazar of UC Berkeley as well as “Days of the Revolution” presented by Dr. Mary Hegland of Santa Clara University. Celebration of Norouz, the Persian New Year and the spring equinox, has also become a tradition of the Persian Studies Program with the third annual concert of classical and folk Persian music on March 9. 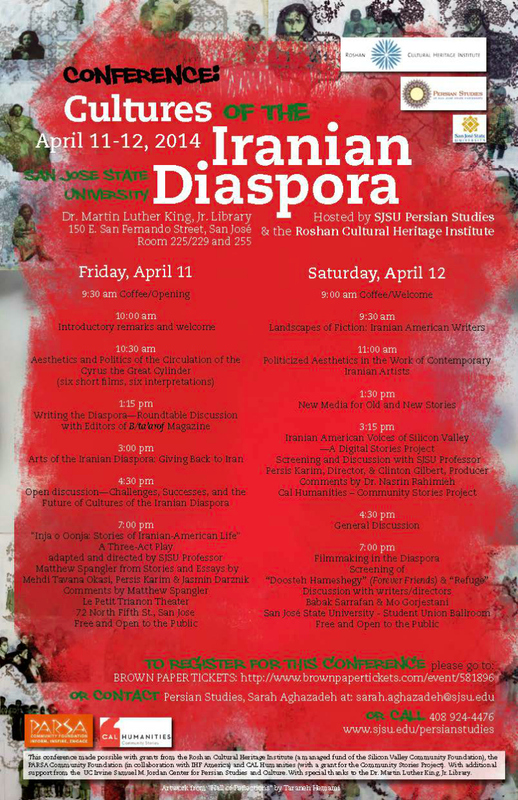 More information for this conference, play and film-screening can be found at SJSU’s Persian Studies Program website. Also, like Persian Studies at SJSU on Facebook for event news and updates. Posted by the San Jose Mercury News March 15, 2014. SAN JOSE — Joining hundreds of other Latinos, Robert and Robyn Rodriguez hustled through San Jose State‘s sprawling campus early Saturday morning with their 10-year-old son, Ceasar, so they could find a seat at a conference intended to boost Latino college attendance and graduation rates. Ceasar, a student at Horace Mann Elementary in San Jose, is doing well in school. He said he wants a college degree “to get a good job.” And his parents share his enthusiasm. 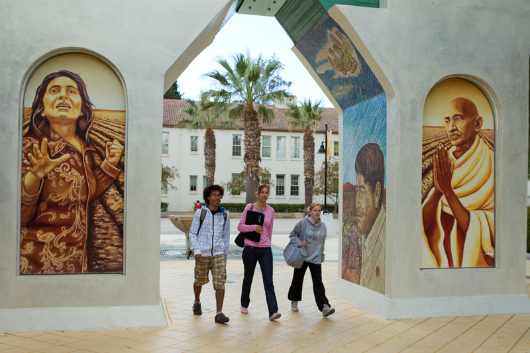 Latinos make up 38 percent of California’s population and are expected this year to surpass non-Hispanic whites as the state’s biggest ethnic or racial group, yet they lag worrisomely behind many other racial and ethnic groups in higher education. Although seven out of 10 Latino high school graduates enroll in college, according to the nonprofit Campaign for College Opportunity, they are less likely than whites and people of Asian descent to get into top schools, attend full time and earn a bachelor’s degree. Indeed, a 2011 study by the Hispanic Foundation of Silicon Valley found that just 14 percent of local Latinos have a bachelor’s degree compared with 52 percent of non-Latinos. That’s a costly educational gap. By some estimates, people with college degrees over their lifetimes on average earn at least $1 million more than those with just a high-school diploma. Posted by the San Jose Mercury News March 1, 2014. 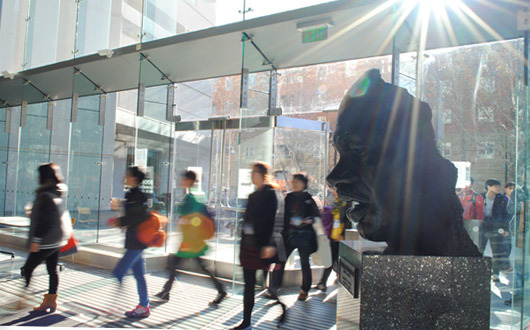 SAN JOSE — Whenever touring black high school seniors consider the sprawling San Jose State University campus, they are impressed by the main library named for the Rev. 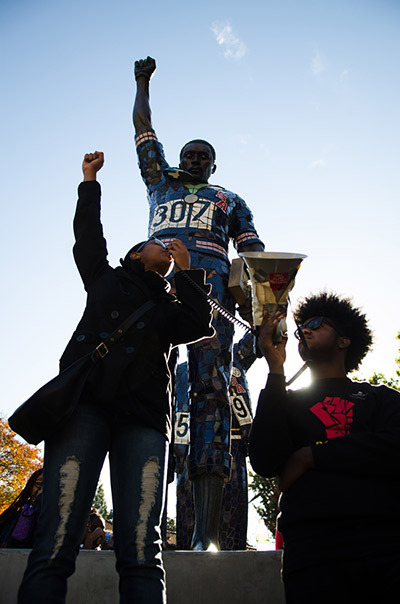 Martin Luther King Jr. and by the majestic statue depicting alums Tommie Smith and John Carlos, raising their fists in the Black Power salute on the medal stand at the 1968 Olympics. But the recent turmoil over a racial bullying scandal has rattled the campus, and many black students are questioning how a university with these outward symbols of diversity leaves so many of them feeling isolated and lost inside. The Assembly Select Committee on Campus Climate will meet March 21 at Morris Dailey Auditorium (Bruce Cramer photo). 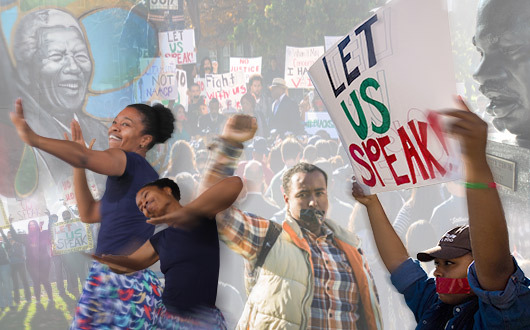 SACRAMENTO – Assembly Member Shirley N. Weber, chair of the Assembly Select Committee on Campus Climate, has announced that the committee will hold its first informational hearing on Friday, March 21, from 12:30 p.m. to 3 p.m., at San Jose State University’s Morris Dailey Auditorium, One Washington Square, San Jose. Students and the public are invited to attend. 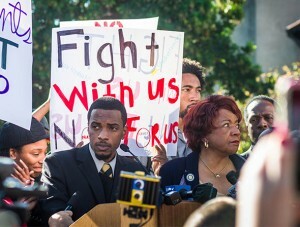 The Select Committee on Campus Climate was formed to explore issues of diversity, tolerance and student safety at the state’s college campuses after a series of bias-motivated incidents in recent years, including a serious incident at San Jose State last fall involving an assault on an African American. This is the first of four hearings to be held throughout the state over the next few months. “Our mission is to ensure that the state’s college campuses are safe and welcoming environments for all students,” said Weber, a former faculty member and department chair at San Diego State University. For more information, please contact Assembly Member Weber’s Capitol Office at (916) 319–2079. No admission fee will be charged so that all can attend. Donations will be accepted. 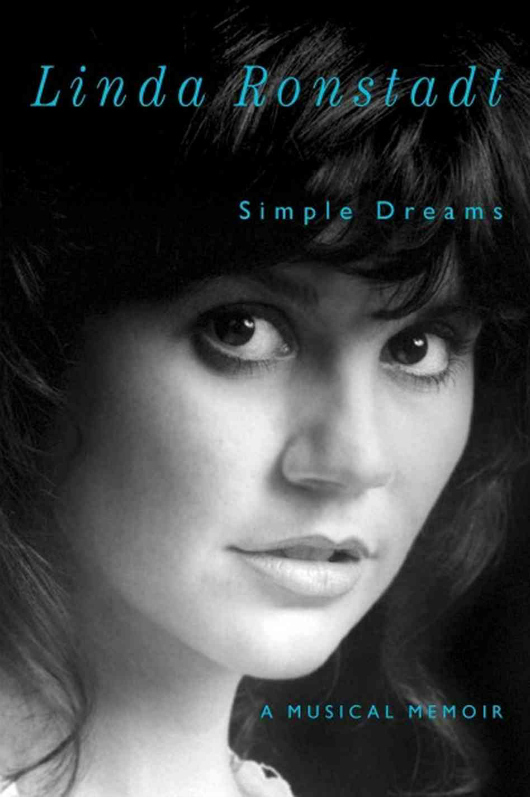 Since publishing her autobiography, Linda Ronstadt has spoken at several pricey Bay Area venues. Professor of Sociology and Interdisciplinary Social Sciences Maria Luisa Alaniz wanted something different for SJSU. This means organizers will request donations, not sell tickets, when the 11-time Grammy Award winner comes to Morris Dailey Auditorium 6 p.m. March 12. Ronstadt will be in conversation with Alaniz and Cesar E. Chavez Community Action Center Director Maribel Martinez, ’03 Political Science and Sociology, ’10 Applied Sociology. Although the performer has lost her singing voice to Parkinson’s disease, music will remain a big part of the evening. 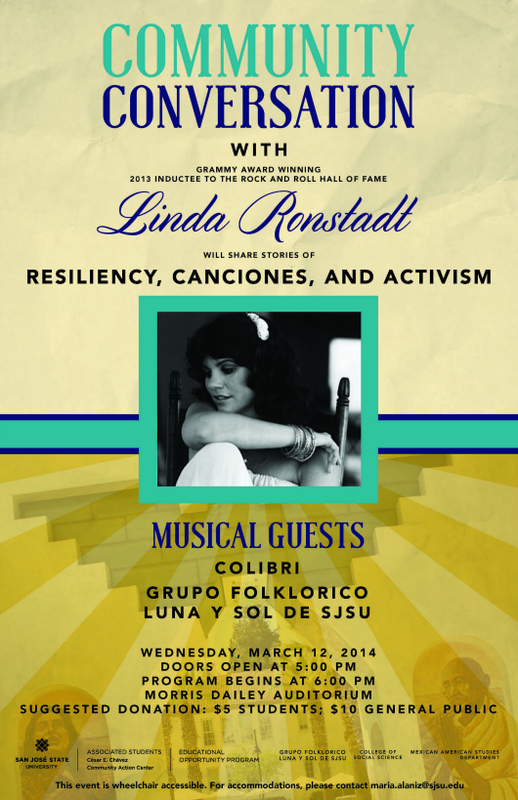 Entertainers include Grupo Folklorico Luna y Sol de SJSU. Ronstadt remains close to San Jose’s Mexican Heritage and Mariachi Festival. Thirty signed copies of “Simple Dreams: A Musical Memoir” will be available at a discounted price at the door. Ronstadt made it look easy. It was not. A fragile beauty in front of the cameras when she emerged on the scene in the 1960s, she fought to forge her own path. She found a way to express her creativity and independence in the tough, competitive music industry,” Alaniz said. Ronstadt eventually returned to Mexican American roots belied by a German last name. She wore a traditional, embroidered suit while receiving a Grammy for her nostalgic 1989 album, “Canciones de Mi Padre” (“Songs of My Father”). “It was just a beautiful thing to see her represent our music while also embracing our culture and our history,” Alaniz said. It’s no coincidence the event’s principal organizers are women. Ronstadt may be older, but her journey resonates through the generations. She was never afraid to lend her voice to social causes, and continues to do so today, making appearances even as her voice falters. 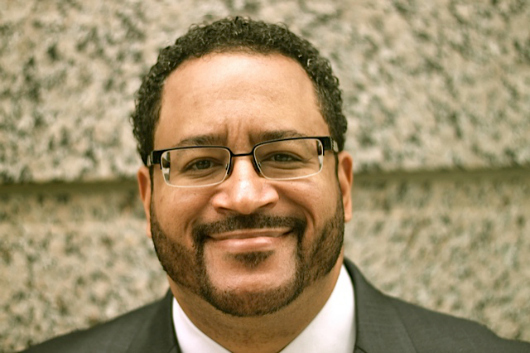 Named one of the 100 most influential black Americans by Ebony magazine, Dyson is a Georgetown University professor of sociology. 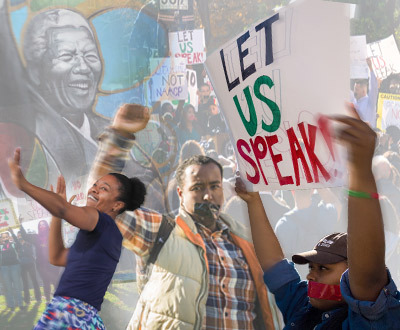 “Are we post-racial, or is racism still a problem?” This question—central to shock waves that rocked campus in response to alleged hate crimes at SJSU—is the topic of an upcoming provocative discussion. 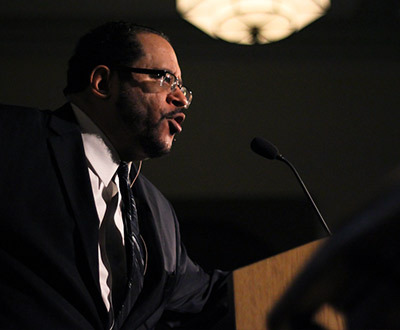 The event will begin at 6 p.m. Feb. 24 in Morris Dailey Auditorium with remarks by Dr. Michael Eric Dyson, a Georgetown University professor of sociology. Admission is free. 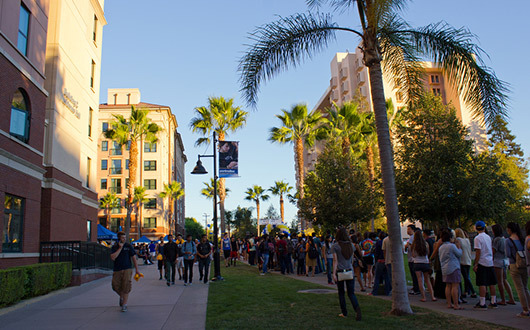 Doors open at 5:30 p.m. for SJSU students with Tower Card, and 5:45 p.m. for the general public. The event will be streamed live on the web and accessible from the university homepage. The audience will be encouraged to submit questions in person or via Twitter, using the hashtag #DysonSJSU. The feed will be monitored by a team of students, faculty, staff and administrators who came together in response to the alleged hate crimes. 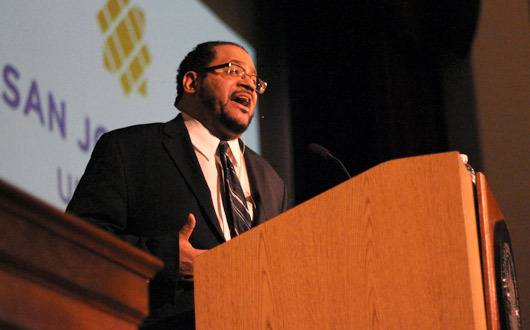 The group is planning a series of events beginning with Dyson, a Detroit native who took an unusual path to becoming one of the nation’s leading African American scholars. According to his bio, he was a welfare father and factory worker before he began college at age 21. Now an author, minister and political analyst, he bridges academia and pop culture. In addition to penning 17 books, he has appeared in the cartoon strip “The Boondocks,” and been name checked by hip hop legends KRS-1, Black Thought and Nas. 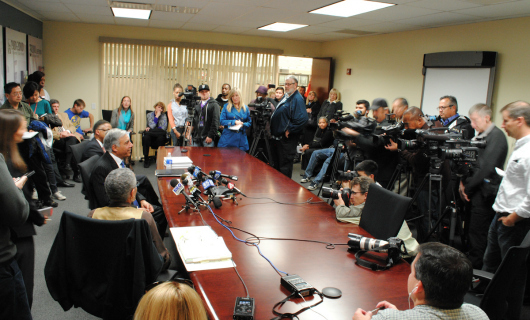 President Qayoumi, Judge LaDoris Cordell and lawyer Myron “Mike” D. Moye address the media regarding the release of a fact finder’s report on alleged hate crimes at SJSU (Christina Olivas photo). Late last year, I pledged to initiate an independent fact-finding review of alleged hate crimes against one of our students, and establish an independent task force to study those findings and offer recommendations for ensuring a safe, welcoming climate for everyone in the SJSU community. The fact finder, Myron “Mike” D. Moye, has completed his work, and the report [PDF] has just been provided to the campus and special task force headed by Judge LaDoris Cordell (Ret.). The task force plans to convene for the first time this Thursday, February 6 to begin studying the report. Judge Cordell and I are firmly committed to an open, transparent process. The public will be able to attend and observe task force meetings; there will be opportunities at some meetings for community members to share their thoughts and suggestions with the task force as a whole. Meetings will be streamed live on the web and accessible from the university homepage. I am grateful to Mr. Moye for his thoughtful, rigorous work, and to Judge Cordell, the SJSU students, faculty, staff and alumni, the CSU and community members for giving their time and talents to the independent task force. I look forward to receiving and sharing their report, which Judge Cordell has said should be completed by April 30. Meanwhile, State Assembly Speaker John Perez has created an Assembly Select Committee on Campus Climate. 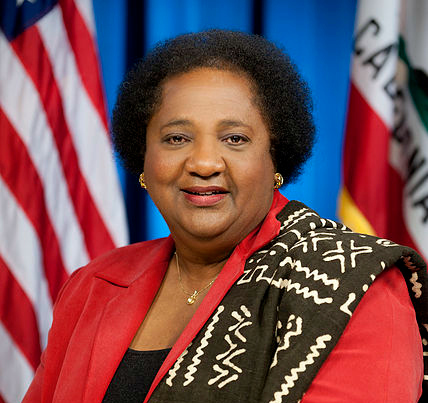 Assemblywoman and San Diego State Professor of Africana Studies Shirley D. Weber will chair the committee, which will hold hearings and make recommendations for the California State University, University of California and California Community College systems. I have met recently with Assemblywoman Weber and Assemblywoman and Speaker Pro Tempore Nora Campos (also a member of the select committee) and assured both that we will work cooperatively with them. I am also meeting with other lawmakers, including Assemblyman and SJSU alumnus Paul Fong. Our own students remain very active, participating in discussions with the California State Student Association and University of California Student Association and calling meetings here on our campus. During King Day festivities at the library, Diana Crumedy and Gary L. Daniels received the 2014 Dr. Martin Luther King Jr. Legacy Award. Daniels is also serving on the special task force. We are proud of their work. I will continue sending you regular updates on our progress on all of these fronts. Thank you for your patience and support. As sunlight streamed through the 20-foot-tall glass walls of the Dr. Martin Luther King Jr. Library foyer, people from all walks of life gathered Jan. 15 to sing, dance and speak in memory of the nation’s beloved civil rights leader. SJSU students Diana Crumedy and Gary L. Daniels received the 2014 Dr. Martin Luther King Jr. Legacy Award. “Injustice anywhere is a threat to justice everywhere,” said Dorothy Poole, chief of staff for the Office of the President. Quoting King during her remarks, she noted that while conditions in our country have improved in some ways, college graduation rates for people of color continue to lag, a point especially relevant in this library, which jointly serves the city and university. As the program ended, the voices of everyone in attendance echoed up through a permanent banner display overhead. One featuring Dr. King is especially poignant this year. Posted by the San Jose Mercury News Dec. 6, 2013. 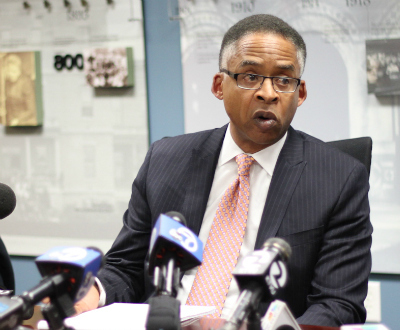 If San Jose State University President Mo Qayoumi wanted a task force that would sweep racial conflicts under the dormitory rug, he made a huge mistake in appointing retired Judge LaDoris Cordell to head it. Cordell’s outspoken nature is of legendary proportion. Most recently, she authored a column on these pages urging felony charges against the white freshmen accused of hate crimes for tormenting their African-American roommate — the incident that prompted Qayoumi to create the task force. And she has dealt with university challenges as vice provost at Stanford. By naming her, Qayoumi signals a determination to confront and overcome this trauma. It’s a very good choice. San Jose State is sharing the following on behalf of the San Jose/Silicon Valley Chapter of the NAACP. Media inquiries should be directed to Rick Callender, callenderr@aol.com. 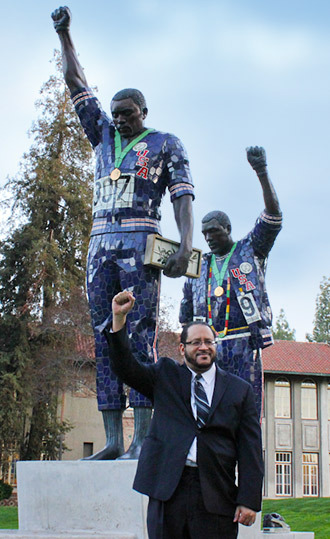 On Monday, Nov. 25, 2013, at noon in front of the Tommie Smith and John Carlos sculpture on the San Jose State campus, the San Jose/Silicon Valley National Association for the Advancement of Colored People will be joined by the California/Hawaii State Conference of the NAACP, the National Office of the NAACP, San Jose State University leadership, Bay Area community leaders and civil rights activists in a press conference condemning the actions of the three San Jose State students accused of racially harassing and terrorizing a black student. The NAACP will be calling for the Santa Clara County district attorney’s office to increase the misdemeanor charges against the three accused SJSU students to felony charges, and also to add the charges of false imprisonment to the charges that the students currently face. 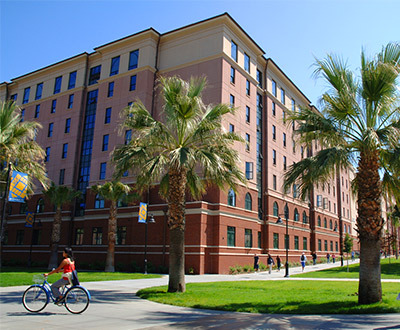 The NAACP will also be calling on the San Jose State University administration to conduct a thorough investigation into University Housing to determine how this situation continued for so long and why no immediate action to rectify the situation was taken. 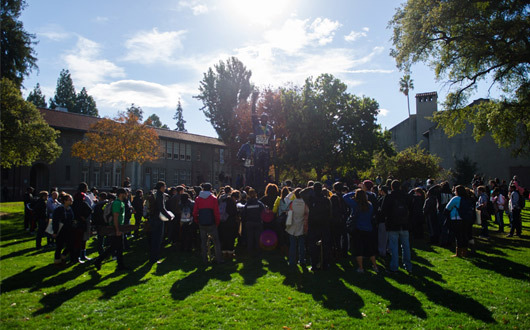 President Qayoumi’s update to the campus community following the alleged hate crimes in SJSU’s student housing complex. A website summarizing all relevant reports, updates and messages has been established. I want to update you on our actions since yesterday (Thursday, Nov. 21) when criminal arrest warrants were issued for several SJSU students accused of racially-motivated hate crimes against a fellow student and residence hall suite-mate. 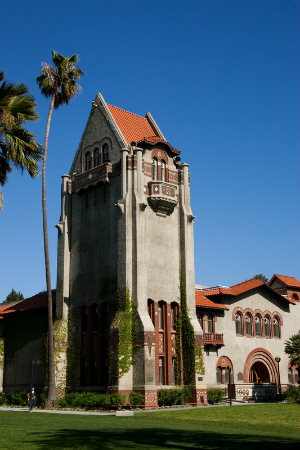 First, a fourth SJSU student has been suspended in connection with this incident. His actions came to light recently in the course of several ongoing investigations. • Appearing together at a noon press conference on Mon., Nov. 25, in front of the Smith/Carlos sculpture to discuss pending criminal charges. • Co-hosting a campus forum during the first two weeks of December, inviting community input about racial tolerance at SJSU and beginning a dialogue on how to heal rifts. • Offering a spring 2014 lecture series on issues of diversity and tolerance. While these efforts move forward, we are undertaking a comprehensive review of SJSU’s student code of conduct. Our goal is including race-based misconduct in existing zero-tolerance student conduct policies. Third, we will review all of our practices and policies related to preserving and protecting the well being of students. This work has already begun. I have asked for a report by Dec. 15, and we will share it with you. President Qayoumi emailed the following statement to all faculty, staff and students regarding alleged hate crimes in SJSU’s student housing complex.A website summarizing all relevant reports, updates and messages has been established. 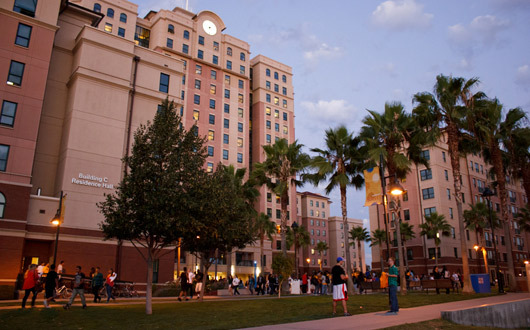 As many of you know, the Santa Clara County district attorney’s office has filed criminal charges against three San Jose State students accused of recurrent abusive behavior toward a fellow student in their residence hall suite this fall. Let me be clear: I am outraged and saddened by these allegations. They are utterly inconsistent with our long cherished history of tolerance, respect for diversity and personal civility. The three students suspected of this conduct have been suspended, effective today. The misdemeanor battery charges include a hate-crime enhancement based on indications that the victim, an African-American freshman, was targeted based on race. I want you to know how San Jose State has responded thus far, and our intentions moving forward. Our paramount initial concern was the safety of the victimized student. The day our housing staff learned of the situation, the University Police Department launched an investigation. Also that day, two of the accused students were relocated to separate residence halls and not placed with roommates. A third suite-mate, originally believed to be a bystander, was identified yesterday as an offender. We regret he was not removed from the victim’s suite before today. Parallel internal inquiries, one based on university student conduct policies and another focused on federal anti-discrimination regulations, are ongoing. We speak very directly to all freshmen about discrimination and harassment during orientation and at hall meetings. We will re-examine our diversity programs and safety measures within campus housing and throughout the university. 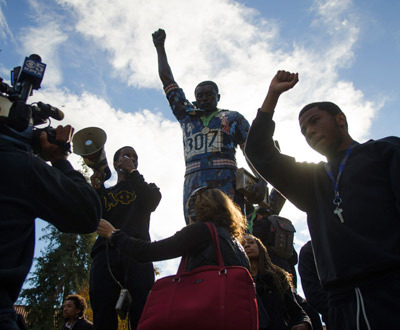 Diversity and a commitment to social justice are in SJSU’s institutional DNA. 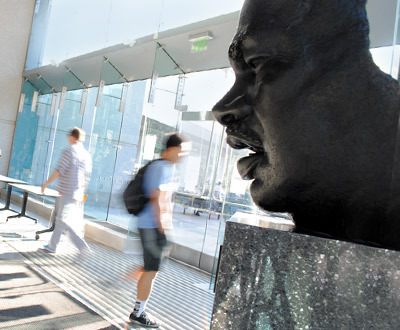 Our library is named for Dr. Martin Luther King, Jr.; many of us pass daily by the sculpture of Tommie Smith and John Carlos or under the Cesar E. Chavez Arch. This deeply disturbing incident reaffirms that we must protect and steward our values. I am proud of all who marched today in support of them.